In terms of nutritionally dense foods for growing healthy brains and bones in kids and babies, I would put bone marrow right up there at the top of the list along with all the veggies, liver and bone broth. 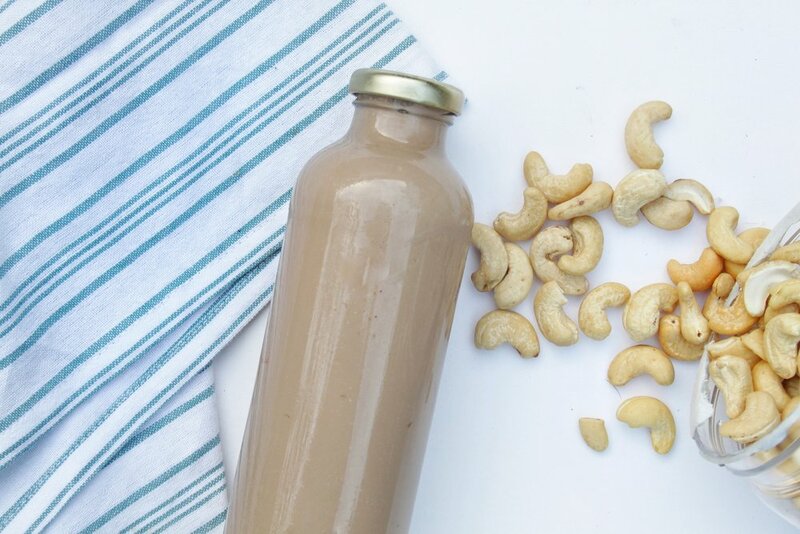 It is not only a fabulous source of heme iron (easily absorbed), but also an incredible source of healthy fat (at a whopping 97% fat ratio), good for satiating hungry tummies, nourishing a growing brain and keeping blood sugar levels stable. It’s also full of essential amino acids that literally help to grow strong teeth, hair, bones, skin, muscles and help with energy production. Growing brains (and all brains, for that matter) need and thrive off of fat. Fat is what makes up the myelin sheath of nerve cells, which is what allows nerve cells to fire and send messages (to think, talk, process and do). If you know me at all, you know I’ve had a long love relationship with bone marrow ever since I first tasted it at some trendy restaurant on the streets of Manhattan. What’s not to love? It tastes like the butter of heaven, after all! 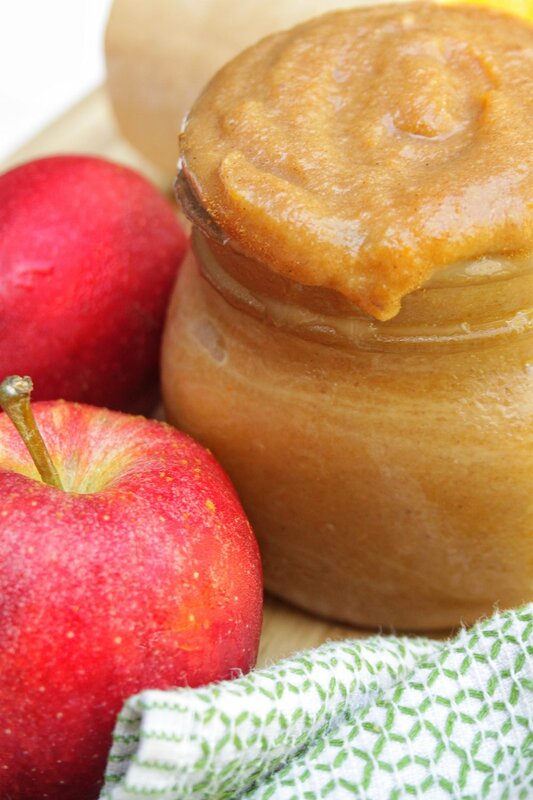 Spread it on crackers or some warm bread with some honey and you’re pretty much good to go! After loving it for its incredible taste, I was so intrigued by it and I had to know everything about it. Learning how it was actually an incredibly nutrient dense food, according to the Weston A. Price foundation, made me fall even more in love. The Weston A. Price foundation touts bone marrow as an extremely nourishing food, found in almost every traditional culture around the globe. Contrary to the western world, where we eat mostly muscle meat, traditional cultures have long valued and cooked the entire animal, including the organs and bones and marrow and mostly feed the muscle meat (which has the least amount of vitamins/minerals) to the dogs. Ok, enough fat and nutrition talk. 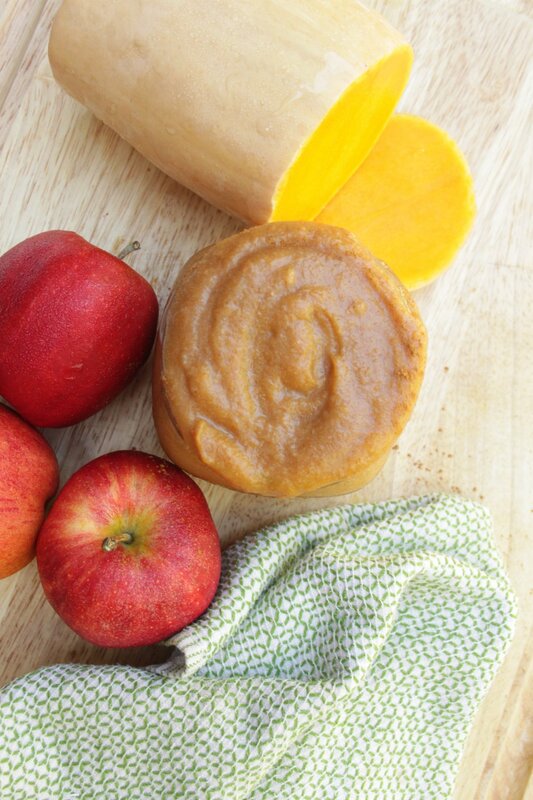 Let’s talk about this glorious food recipe discovery, Butternut Squash + Bone Marrow Apple Sauce! You need this in your life, trust me on this one. It has it all in my book. Sweet AND savory AND a fruit, a veggie and a healthy source of fat and iron. You literally couldn’t make a more healthy dessert for you and your little people if you ask me. 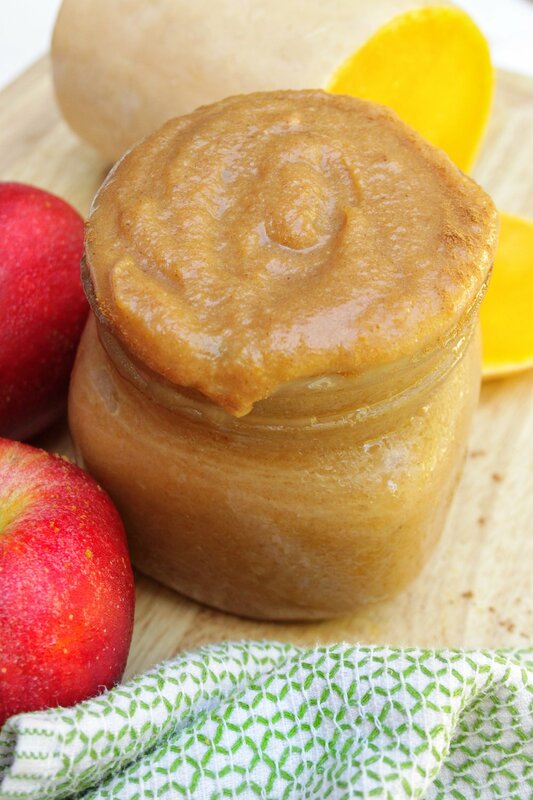 A great food for babies and kids of all ages and also a great snack for anyone who is on the Whole30 diet. It is It is literally SO easy to make you won’t believe it! Heres how to make it. Add marrow bones to a pan and roast for about 15 minutes or when it begins to bubble around the edges. When its finished roasting, scoop out the marrow with a butterknife. In a crockpot or Instapot, add the marrow and all the other ingredients. For a crockpot cook on low heat for 6-8 hours. In the Instapot, set on high pressure for 10 minutes. When it is finished, use an immersion blender to combine all the ingredients and enjoy! Feel free to add extra agave if you want to sweeten it up a bit more. Am I right that there’s nothing like pancakes on Saturday morning? And when all your kiddos want is pancakes, you better believe I’ll be finding a way to add some greens into the situation. The biggest qualm I have with pancakes is that they’re typically made from processed white flour, which translates into pure sugar in how its absorbed and assimilated into the bloodstream and digestive track. In other words, it spells out major kid blood sugar spike followed by an inevitable crash of emotions. Also, they’re pretty lacking in the nutritional department. These Hulk Powers Pancakes, on the other hand, won’t leave you with a sugar crash 10 minutes later and they also won’t leave you hungry either. They’ve got some true superpower ingredients including flax seed, spinach and even barley grass powder if you dare to be brave! Barley grass is high in many vitamins and minerals, including vitamin C and it can help aid the liver in detoxifying. It’s also been used to help reduce excess acidity in the body. You can find it in powder form and add it to smoothies or whatever else you can think of! To be quite honest, pancakes have been quite a challenge to me lately. Partially because I’m always trying to add some obscure ingredient (see above) and partially because I’m a tad challenged in the flipping department. BUT I’m so happy and a smidge proud to say I finally found the right ingredients and the right method to make healthy breakfast pancakes. Cue my inner mini-celebration. Process the oats in a blender or food processor until finely ground. Add the almond flour and the other dry ingredients (cinnamon, baking soda, barley grass powder). Add all the ingredients (wet and dry) into a high-speed blender until pureed. Heat a cast iron skillet on medium heat with coconut oil. Add the pancake batter in batches of 4-5 at a time until the batter is finished. Note: They tend to be a smidge on the thin side so if you like them thicker; add your first batter to the pan and wait a second for it to cook a bit around the edges and form before adding a bit more batter for thickness. Also if you don’t have barely grass powder, you can totally skip it (it’s optional) and the recipe works fine without it. Well, its October, and even if that doesn’t necessarily mean cool weather here in Miami, it still means my husband will be watching endless hours of football on weekends and I will be baking Pumpkin flavored everything, obviously! Pumpkin muffins, pumpkin pancakes, pumpkin cookies, pumpkin pie, you name it, I’m determined to try to make a healthier version of whatever it is. My criteria for healthy in our household means cutting out the flour and fast acting sugars and carbohydrates and replacing them with blood sugar stabilizing proteins and fats. I was searching Pinterest for a pumpkin muffin recipe that met those criteria but couldn’t find the right one, so I decided to make my own version. I was so excited about how wonderful they turned out that I just had to share them with you all. These sweet Chia Almond Flour Pumpkin Muffins are the perfect breakfast on-the-go or a healthy midday snack and they are super kid friendly. Not only are they moist and delicious, they are packed full of protein and blood-stabilizing healthy fats/omega-3’s from the almonds, chia seeds and eggs. They are quick and easy to whip up, coming together in only a few minutes! What are you waiting for?? Get your baking mitt on and get in the kitchen! Line muffin tin and set oven to 350 degrees. Smash a ripe banana in a large mixing bowl with a fork. Add in the eggs and beat and combine well. Add all the other wet ingredients: vanilla, honey/agave, coconut oil and pumpkin purée. Mix and combine well. Toss in the remaining dry ingredients, making sure to distribute the baking powder evenly. Combine well. Pour mixture into muffin tins about 3/4 of the way full. Bake for 25-30 mins at 350 degrees or until the edges began to brown. Let cool for 10 minutes. My kids absolutely love Chick-fil-A chicken nuggets. But, since we try to avoid gluten like the plague in our household (my son and I both have difficulty digesting it) we don’t really frequent fast food joints very often. Besides gluten, the list of additives in their chicken nuggets makes my head spin. These nuggets, on the other hand, are made with 100% organic ground chicken and almond flour and some yummy spices, nothing to make my head spin here. Just yummy, whole food goodness! So yeah, I gave my best effort to re-create a healthier version for the kiddos and I think I hit the spot. The kids loved them SO much that the next time I made them, I doubled the recipe so that I could have nuggets for school lunches throughout the week. What I’m getting at is, these little nugs are great for anytime, really. 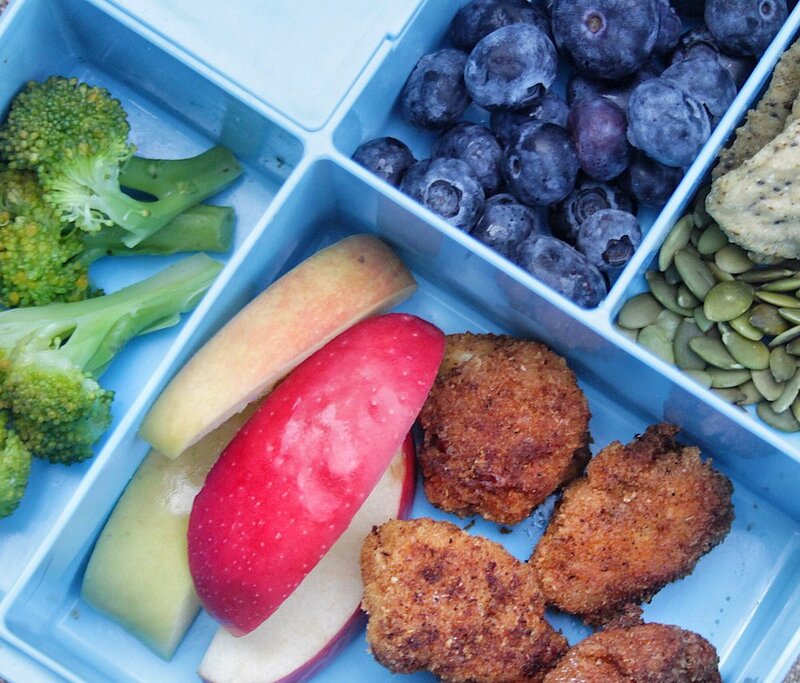 School lunches, snack time or a fun and easy toddler-friendly dinner. Other than the time it takes to fry these bad boys up, how easy would it make your school week to throw these in for the protein of the day?? 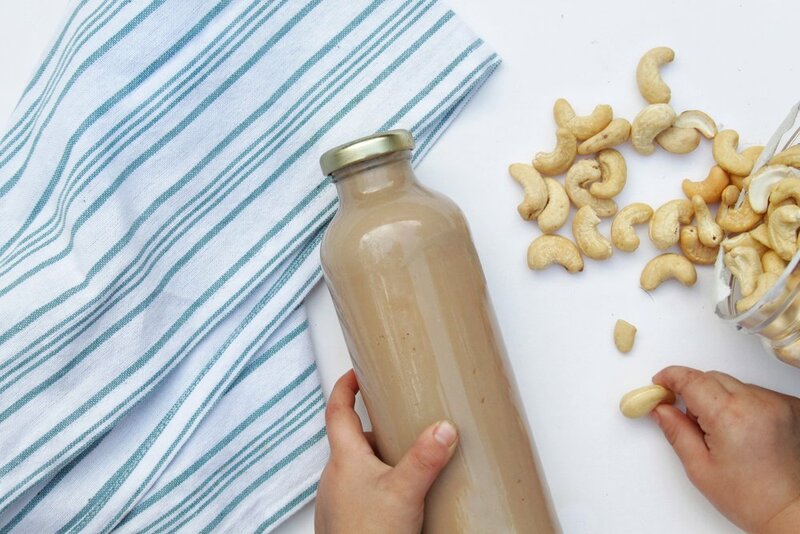 If your school is nut-free, you can substitute with coconut flour instead. I honestly would love to make ahead an enormous batch of these nugs to save in the freezer for those days when I’m in a pinch for time and the kids are hungry. Putting it on my to-do list now. Just kidding, there’s no way I will likely have time for that. They are crunchy on the outside and soft and delicious on the inside, just like the real deal. I’ve seen many gluten free nugget recipes out there that use sliced chicken breast but the ground chicken really makes the inside texture so soft and moist, your kids will think you just went through the chick-a-filet drive through! In shallow bowl, beat the two eggs. In another shallow bowl, mix the dry ingredients. Set out a large plate with paper towels for drying the finished nuggets. Put all the dishes in an assembly line for quicker cooking and less mess. Heat coconut oil in cast iron skillet over medium or medium-low heat. Dip about 5-6 balls at a time into the egg mixture, gently squeeze out excess egg, then roll the balls in the dry ingredients until coated. Use the back side of a fork to gently press each nugget into the oil and cook the nuggets about 3 minutes each side (be careful not to burn) and then transfer onto paper towel lined plate. Work in batches of 5-6 until all the nuggets are cooked. The reason that this topic is so near and dear to my heart is that, in this country, 1 in 4 children suffer from a diagnosed feeding disorder. What this translates to in the developmentally delayed population, is that 80% of children with developmental delays (or 8 out of 10 on a typical occupational therapist or speech therapists caseload) have an eating disorder. Many 1 year-olds I treat in the clinic don't display age-appropriate oral motor skills and lack the ability to chew. Babies should have the ability to chew a variety of different foods by the time they reach 11-15 months old. The truth is that babies brains and bodies are growing by the minute in the first year of life and they need to be introduced to nutrient-dense, whole foods that are going to nourish their brains and set them up for healthy growth and development. They also need to be set up for a healthy relationship with food by having parents and family members act as positive role models surrounding the mealtime environment. I truly feel there is a dissconect happening with the introduction foods in our country. I believe mothers need more guidance and support on what is nutritious to feed their infants and toddlers and how to do it. 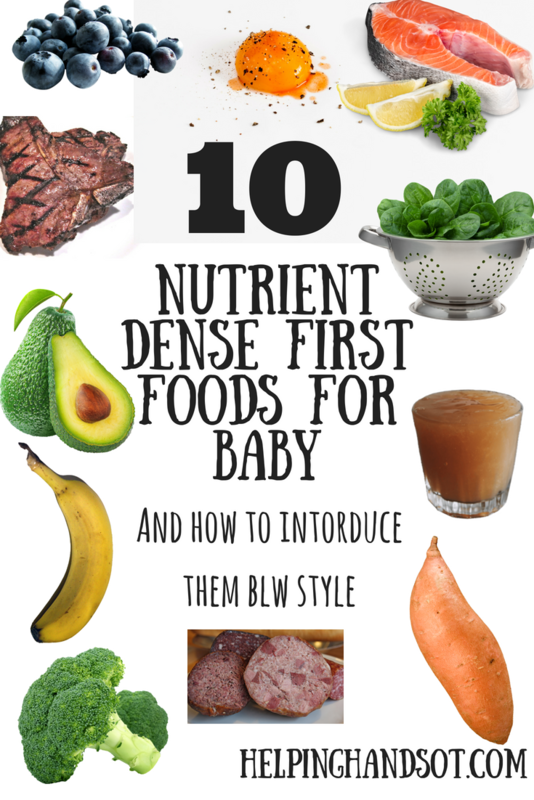 That is why I have put together a list of 10 nutrient-dense foods that are a great starting point for your babies introduction to the food world. I am going to talk about the nourishing benefits of each food and also discuss how to introduce them baby led weaning style. First, though, lets review a few talking points and terminology. Most experts in feeding agree that food introduction should occur around 6 months of age. We now know through research that 4 months is too early for their developing digestive systems. I recommend slowly introducing solids anywhere from 6-8 months of age while carefully watching for food reactions and sensitivities. From a developmental standpoint, it makes sense to begin introducing solids around 6 months, since this is when your child begins to sit unassisted, can maintain balance in a highchair and begins to develop their grasp. First coined by Gill Rapley and Tracey Murkett in their book Baby-Led Weaning: The Essential Guide to Introducing Solid Foods, Baby-led weaning is an approach to introducing solid food where baby is allowed and encouraged to self-feed solid finger foods instead of receiving purées via spoon. The term weaning is confusing, so let me clarify. Baby led weaning is not really weaning babies off of breastmilk or formula, but rather weaning them (slowly exposing them to) onto solids. The idea is that, during this phase of food introduction, babies will naturally begin to decrease their milk consumption (in correlation to the amount of calories that are taken in via food). Are given the freedom to explore new tastes and textures with their hands and mouth. Are never pressured to finish or eat a certain amount of food. Are encouraged to join the family at mealtime and typically eat the same foods the family eats. "Solids" offered are not necessarily completely solid foods. Soft veggies and meats are good starter introductory foods. As the babies oral motor skills develop, a wider array of solids are offered. Are allowed to make a mess during mealtime. I feel strongly that, if done safely and correctly, baby-led weaning is the best choice. Spoon feeding and long-term purees can cause delays in oral motor skill development and it takes away the babies innate desire for autonomy during mealtime. It has been my clinical experience that babies whose parents used more of a BLW approach develop more healthy relationships with mealtime and display less picky eating habits overall. Exclusively breastfeeding for atleast 6 months has been known to decrease incidence of food allergies. (See studies here or here) Even if the child is breastfed exclusively, it is important to monitor for symptoms of food allergies and intolerances very carefully and talk to your pediatrician about any concerns. There is a big difference between a food allergy and a food intolerance. A food allergy is a total immune system reaction to a food that can be tested for via markers in the blood or stool. A food intolerance is an inflammatory response in the digestive system that occurs in a response to a food. Food allergies can be tested for, whereas food intolerances are only able to to be monitored via the observation of symptoms. Many children have food intolerances to wheat and dairy proteins but not a diagnosed food allergy that can be tested for. Introducing these foods earlier rather than later, while carefully monitoring for immune or digestive responses, is best. Delaying the introduction of certain foods for longer actually increase the chance of food allergies (the early introduction, the better). As a mother of two young children who was once terrified of choking, I can relate to the intense fear that surrounds food introduction and choking. I can now say I have mostly recovered from this fear through my own BLW experience. The most important thing I want to point out is that there is a big difference between gagging and aspiration. Gagging or eliciting the gag-reflex is a normal, necessary component of learning how to chew. The gag-reflex is a wonderful protective mechanism by which the body (at the brainstem level) protects itself from true danger (aspiration) Believe it or not, babies are designed to gag on objects entering their mouth from the moment they exit the womb. The gag reflex is more sensitive in the first few months of life and slowly desensitizes and moves further to the back of their mouth as the baby enters into the first year of life. Aspiration, on the other hand, is when food enters the airway. It isn't always a life-threatening situation but it certainly can be. If you want to learn more about aspiration and gagging in babies I have linked two articles below that are very informative. So here you go Mamas! I selected all my favorite toddler and infant whole foods that are high in calories, vitamins/minerals, protein and healthy fats, which growing brains and bodies thrive off of. Do your best to stay clear of pre-packaged foods and anything labeled fat-free or low fat for babies. My hope is that you and your little one can enjoy learning the joys of healthy eating together! BLW idea: Cut avocado in half and remove the seed. Then cut the avocado in half one more time lengthwise. Offer to baby this way; they should be able to maintain gasp of it while self-feeding. Eggs are rich in protein and contain significant levels of vitamin A, B-complex vitamins, vitamin D, E and K as well as phosphorous, selenium, calcium and zinc. (4) Furthermore, eggs also have various key organic compounds, such as omega-3s, antioxidants and protein. (4) I like to offer the more caloric and nutrient dense portion of the egg, the yolk to babies due to their higher fat content. BLW idea: Prepare yolk by pan frying or boiling for a minute or so in water so that it is par-cooked. If it is formed, you can offer the yolk to baby whole (gently fork smashed). If it is less-formed or runny, you can offer it on a spoon with assistance or by dipping it in for them and offering the baby the spoon. Two to three yolks with some veggies or fruit is a great way to start the day for breakfast. The various health benefits of spinach are due to the presence of minerals, vitamins, pigments, and phytonutrients, including folate, vitamin A, niacin, Vitamin B6, vitamin C, vitamin K, potassium, manganese, zinc, magnesium, iron and calcium. (5) Spinach is high in insoluble fiber, which can aid in healthy digestion. Spinach is known for its benefits to the eyes and the heart and has anti-cancer and anti-oxidant properties as well. Bone broth is great for the digestive system, the hair and skin and is a powerful defense against colds/flu to bulk up the babies immune system. It is an abundance source of essential amino acids and other nutrients like calcium and magnesium. You can click here to learn about the healing power of bone broth. BLW idea: You can offer home-made bone or store bought warmed in an open cup (baby will need assistance at first) or you can offer home-made chicken soup with all soft veggies. Babies need assistance from the parent for soups. Here is an easy recipe to follow for DIY bone broth/chicken soup. BLW idea: My favorite way to offer blueberries is to wash them first and then smash them onto babies tray (you can use your finger). After several weeks of eating them this way, baby should be able to manage a whole blueberry without choking. Blackberries and raspberries are also good choices that you can offer in the same way. BLW idea: Simply cut the banana in half and offer it to them whole. The introduction of the whole food to the front of their mouth is natural. Once baby takes a small bite, they will begin to move it from the front of their mouth into the side gums (or molars) to smush it before swallowing. BLW idea: Steam broccoli until soft (or fork tender if you prefer softer). Cover with a topping of grass-fed ghee, butter or olive oil. If offering florets whole, offer the larger ones (smaller florets can be a choking hazard if the baby places the whole floret in their mouth). If fork tender, you can mash with some butter and a pinch of salt on babies high chair tray. Beginning around the age of 6 months, breast milk iron supplies begin to decline in the breastfeeding mother. Your pediatrician may start checking for iron deficiencies and asking about iron supplementation around 12 months. The idea that meat shouldn’t be introduced until later is an outdated way of thinking. Babies bodies and brains are craving the nutritional value of iron. Yes, you can get iron from non-animal protein sources like through raisins, spinach and cereals that have added iron. However, heme-iron is much more easily assembled and absorbed than non-heme (plant based) iron sources. Believe it or not, liver (that is locally sourced and grass-fed) is one of the most nutrient dense foods you can offer your baby. If you don't believe me, check out this nutritional chart from Chris Kresser's website that compares the nutritional value of liver to other foods. BLW idea: For beef, I usually only offer pot-roast style (slow cooker tender) at first. Fork smash and offer dime size pieces at first on babies food tray. For liver, I usually cut it into small pieces and pan fry it in ghee with a sprinkle of sea salt or onion powder. You would be surprised to find out that babies love liver! Find out more information on liver and other ways to prepare it here. 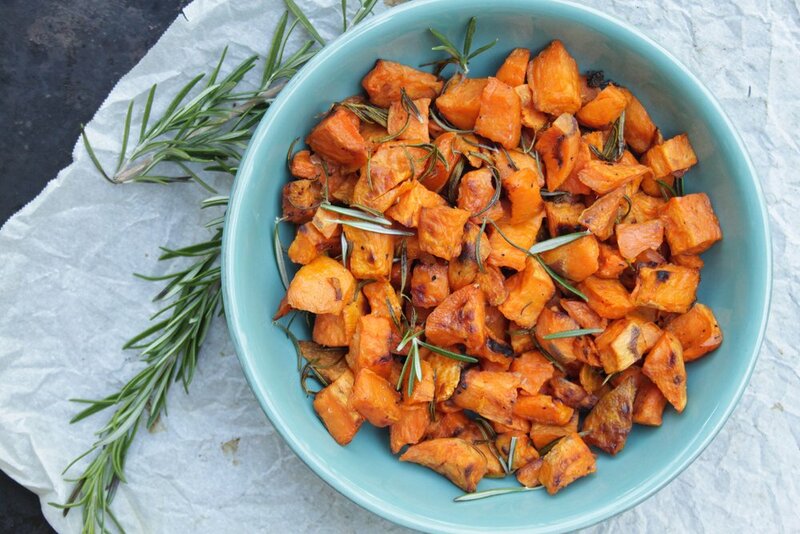 BLW idea: Bake sweet potatoes in the oven and offer it fork smashed with grass-fed butter, ghee or coconut oil. 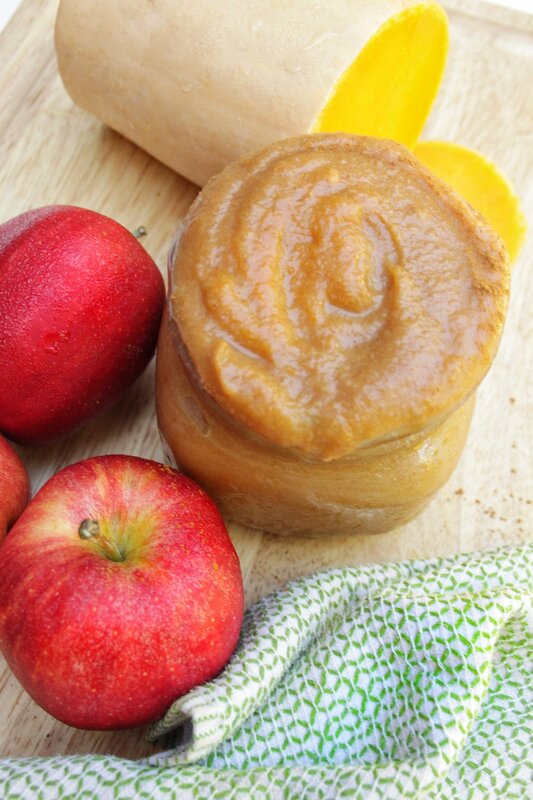 If you wan to make more of a puree, you can puree it (manually or with a hand blender) and offer the baby a small dish with a spoon for self-feeding. As an option, you can add some black-strap molasses (to increase the iron content) or maple syrup to sweeten it a bit. Johanson, Nina. (MS, CCC-SLP). "The AEIOU Systematic Approach to Pediatric Feeding." October 2016. Education Resources, Inc. PowerPoint Presentation. It is no secret that adequate fat and cholesterol consumption is they key to healthy brain functioning. Fat is what myelinates nerve cells in the brain, which makes it possible for new neural pathyways to develop (for thinking, remembering, motor planning and learning). But how often do we forget that our children need it even more than we do? Since children's brains literally D O U B L E in size from birth to age two, they NEED these fats in their diet in order for healthy brain development to occur! The AMDR for fat for children ages 1-3 years is 30-40% of calories. So this means that if your child is no longer breastfeeding (before turning two), you need to make sure they are consuming adequate fats and oils in their diet. Breastfeeding mothers should also be conscious of consuming adequate fats and oils in their diet, to produce a balanced fat/carbohydrate ratio in breastmilk for baby. With the chaos of motherhood, it can be hard to remember and brainstorm ideas for healthy fats and oils. Which is why I decided to make a list of my favorite sources of healthy fats for kids (and mamas!) Just remind yourself to look for at least one source of protein, fat and healthy carbohydrate during every meal! Avocados: Avocados are so versatile. You can smash them and make guacamole dip, add guac to toast, chop them and offer them individually or add them to soups. Cooking with coconut oil and extra virgin olive oil: Cook eggs with added oils, add them to salads or spreads, etc. Organic dairy: grass-fed butter, ghee and organic dairy such as full fat milk or full fat yogurt. Pasture raised eggs: So many options for eggs! Scrambled eggs, hard boiled eggs, fried eggs, etc. Sardines + wild organic canned salmon: A great source of omega-3 fatty acids and calcium and magnesium. You can make a suedo-tuna fish salad or just add them atop avocado toast. Hemp seeds + chia seeds: These are a great source of omega-3 fatty acids and you can literally add them to everything! You can sprinkle them atop toast with almond butter & honey, put them in yogurt, add them to homemade cookie recipes or add them into smoothies. Olives: Greek kalamata olives are my favorite but pretty much all olives are great sources of healhy fats. If you don’t eat fish often, fish oil is a good option! We use this brand at our house. It is SUPER yummy tasting and the kids literally run to get their fish oil! **Organic dairy products: While the pasteurization and homogenizing process is beneficial for removing harmful bacteria, it also removes essential vitamins and minerals and makes the proteins difficult to digest for many people. Raw organic milk does pose some risks but if you can find a local farm that does a more gentle pasteurization process, this might be a healthier choice than purchasing store bought milk. With the New Year excitement lingering in the air, I decided I am joining the bandwagon and trying to eat more Whole-30 friendly meals and offering more veggies at every meal for my kids. The only thing holding me back is, well, carbs. Darn you bread. Luckily, tomorrow is a new day! And thankfully, this healthy little number is New Years diet + Whole-30 + Kid-approved, so I still have that going for me! Sweet potatoes are my go-to when I am attempting to cut out the junk. They can be sweetened up with butter + agave for a sweet tooth craving (try this NOW) or baked into fries, so many options! All these options got me thinking of hash browns and so I got to cookin’. These turned out SO good with only a few simple ingredients and everyone enjoyed them! I would not make these on a busy weekday morning as it takes a while (like pancakes) to wait and flip them all but on a lazy Saturday, yes! Next time I make these, I am planning on doubling the recipe for week time meal prep. They would be a great addition to toddler lunches. Peel and then shred sweet potato. In large bowl, mix sweet potato, egg, and salt and pepper. Massage mixture well with hands. Head pan on stovetop to medium high heat, add 1 tbsp coconut oil. While pan is heating, form 1 inch ball of mixture with your hands. Place and flatten into the oil with spatula. Don’t move until that side is crispy then flip. Continue this process, cooking three or four at a time until finished. I have been on the hunt for a healthier version of the store bought peanut butter chocolate chip granola bars without all the gluten and yucky food additives. I really wanted something healthy and sweet and also was looking for an pack-able kid-snack for when I’m out in public and my kids are getting H A N G R Y. After leaving the grocery store empty handed, and not wanting to venture out to Whole Foods, I decided I would give it a go on my own. I was pleasantly surprised at how amazing these turned out on my first try. They were a hit with my kids and the husband too, who sometimes thinks my healthy sweets are not as good as the real thing. My kids called them "cookies" and I just went with it. I love having healthy snacks around the house for the kids obviously but also for myself when I am having sugar cravings and feel like I just might smash down an entire bag of my sons animal crackers. These are absurdly simple, no bake required and have only 5 ingredients you probably have in your cupboard. Sunflower seeds and dark chocolate boost the nutritional value of these little granola bars and give them a deliciously chewy texture with just the right amount of crunch. They are packed with a little sweetness, fiber and some great sources of protein and fats. So what are you waiting for? Go make these bars ASAP. Place all ingredients into a food processor, pulse until semi-smooth texture but don’t mash it completely, still leave some seeds and chips intact. Place the ingredients into parchment paper, mash it down with your fingers until you form an even layer. Cover & freeze for 4-5 hours.